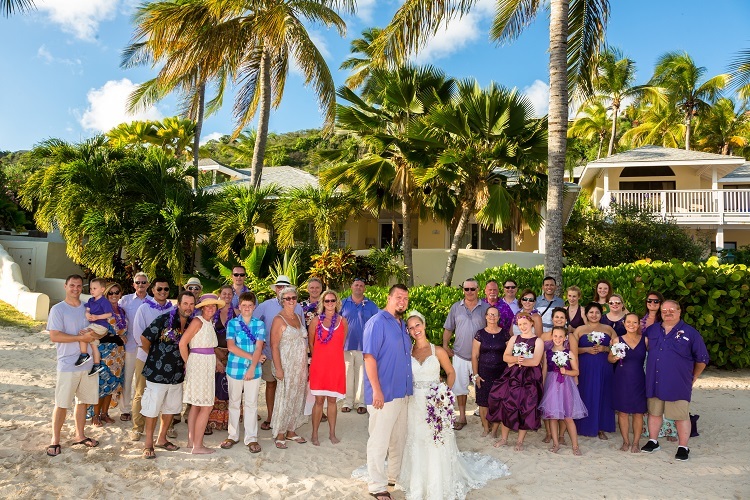 Real Wedding: Katy & JR’s Destination Wedding in Antigua! JR and I met in Hilo, Hawaii. We were both travel RNs taking assignments in Hilo. The first assignment JR arrived, him and I became best friends traveling around the island, traveling to other islands, and experiencing the Hawaiian life. Three months later it was time for JR to return to home to Florida. JR and I stayed in touch via telephone and computer. A year passed and I received a phone call late one night. It was JR telling me that he was planning on coming back to Hilo for another assignment. Our friendship continued to grow in these 3 months he returned to Hawaii. Later on, he continued to offer me emotional support as a friend during my three-year schooling process. We confessed our crush on each other while living in Hawaii and decided the timing was appropriate to see if this relationship could be as strong as our friendship. Five years later he proposed to me on a Gondola ride in Florence, Italy!! JR is from Florida; I am from Texas. The decision of where to get married was discussed, considering someone’s family would have to travel if we chose our home states. 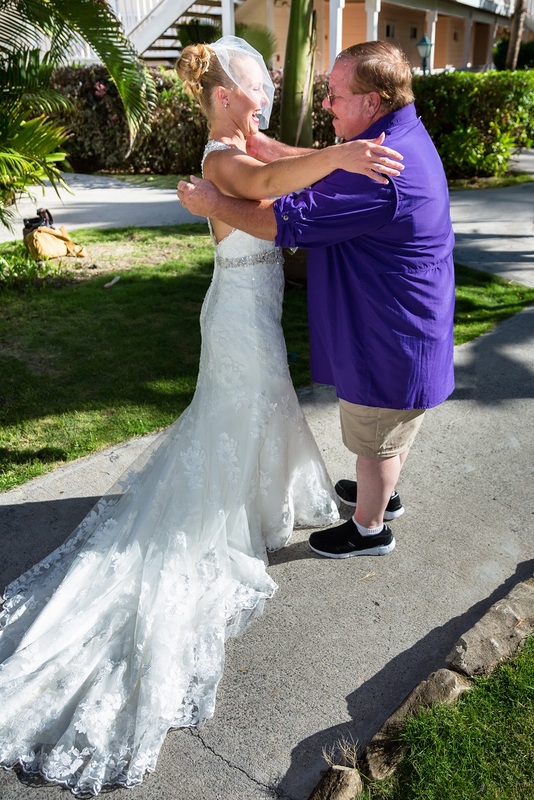 Both of our families assumed the wedding would take place back in Hawaii. But JR and I decided as much as we love Hawaii, we didn’t want our wedding there. 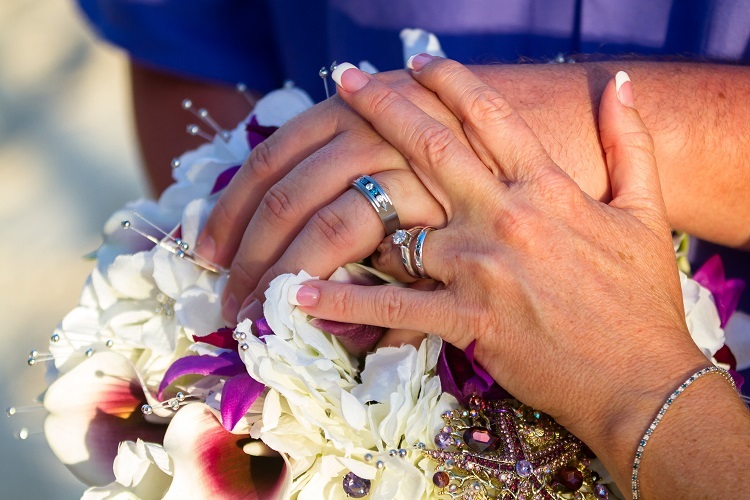 We wanted to build new memories, so we contacted DestinationWeddings.com to help us with this decision. The idea of Cancun, Jamaica, Dominican Republic, or Mexico did not really appeal to us at the time. Our wedding Specialist listened to our concerns and requests. 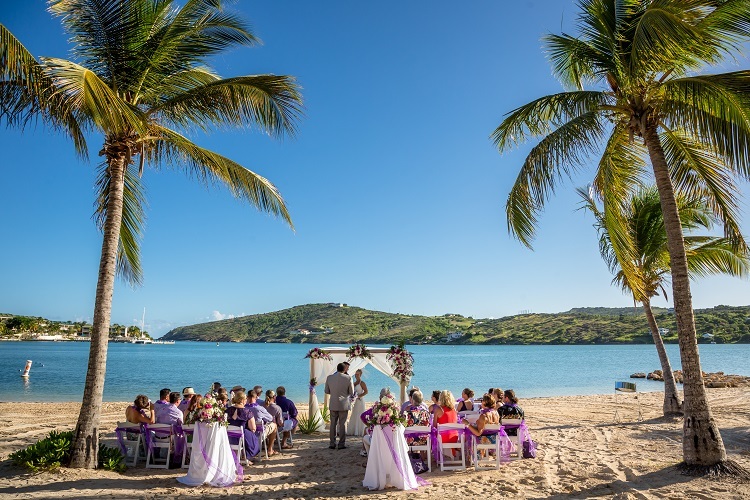 We thought about US Virgin Islands, but eventually decided on Antigua!! 365 beaches on the island, one for every day of the year. 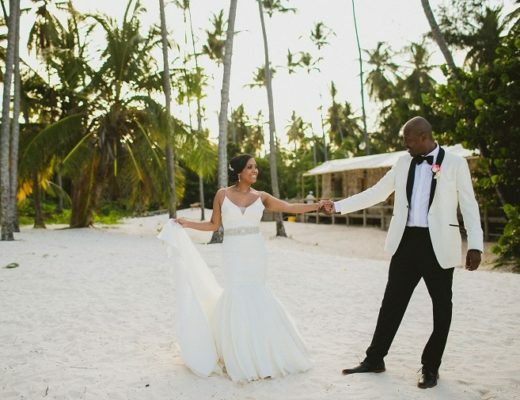 How can you beat that for a destination wedding?! 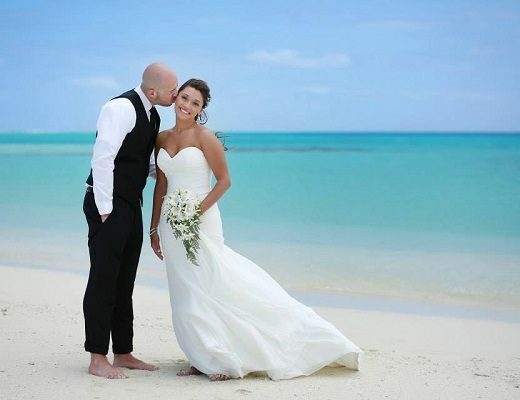 We spoke with our DestinationWeddings.com wedding Specialists, about our ideas. 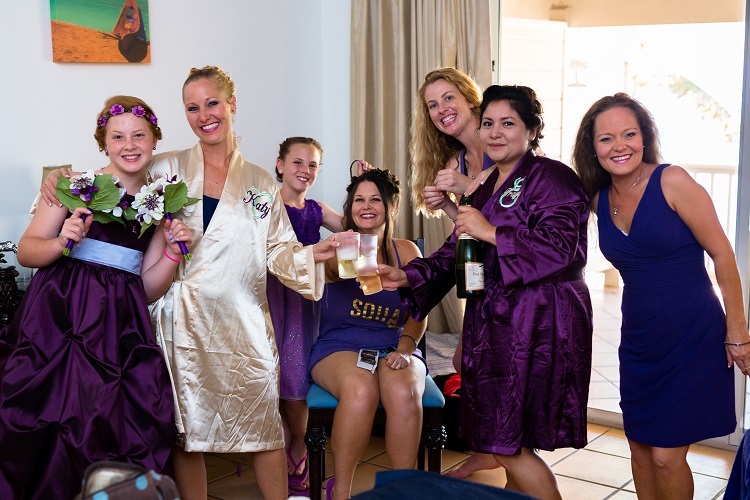 Our initial decision for the destination wedding was looking at costs and time frame of travel, but we mostly had family and friends in mind. We wanted an all-inclusive resort so that our loved ones paid one price and the vacation was covered from that point on. The all-inclusive choice was an absolute!! JR and I are very outdoorsy people who love the ocean, so a beach wedding was also a must. One day I was searching online best beaches in the Caribbean and Antigua was consistently in the top 5. I spoke to our Specialist the next day about Antigua and she suggested all-inclusive resorts. 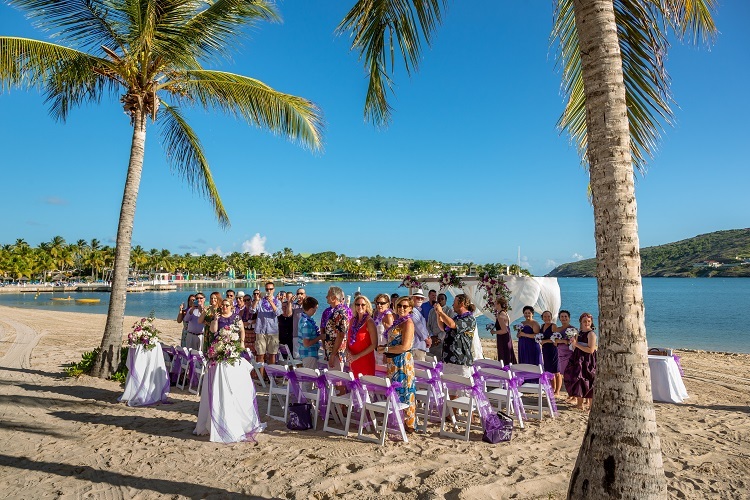 We chose St. James Club & Villas because of the ability to personalize the ceremony to our taste and for the occasion, it succeeded our expectations. Aside from the resort options for the wedding, reception, and photography, I also chose to personalize the wedding before traveling. Aside from picking the wedding dress of my dreams, I chose to personalize the floral bouquets. The resort offered fresh flowers, but I wanted to personalize each bridesmaid bouquet and my cascading bouquet with personality. 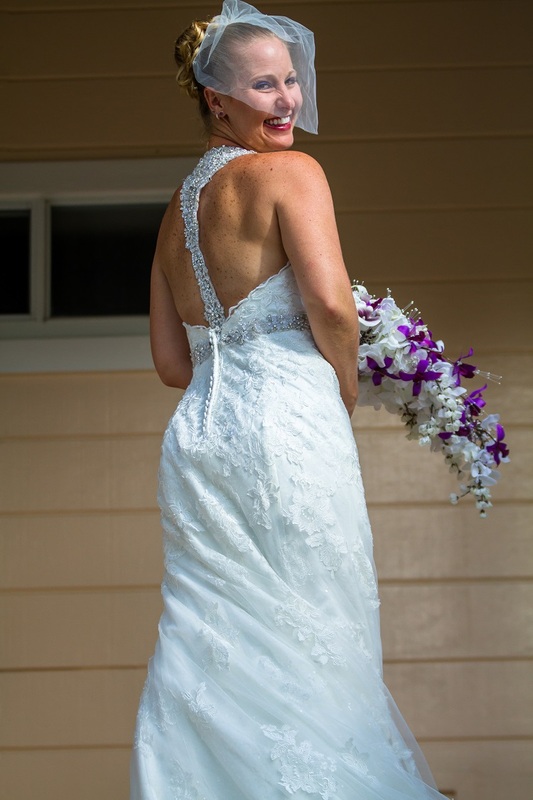 I bought silk floral bouquets on Etsy in my color purple. I then took each bouquet and added rhinestone broaches to add color and shine to them. I think this added my personal style to the floral arrangements that wouldn’t have been possible had I purchased the fresh flower option. Another personalization for the wedding was the footwear for the ladies. The wedding took place on the beach, so I decided to make barefoot sandals for all the ladies attending the wedding. I made myself, the bridesmaids, and guests all barefoot sandals and gave them as wedding attendance presents. 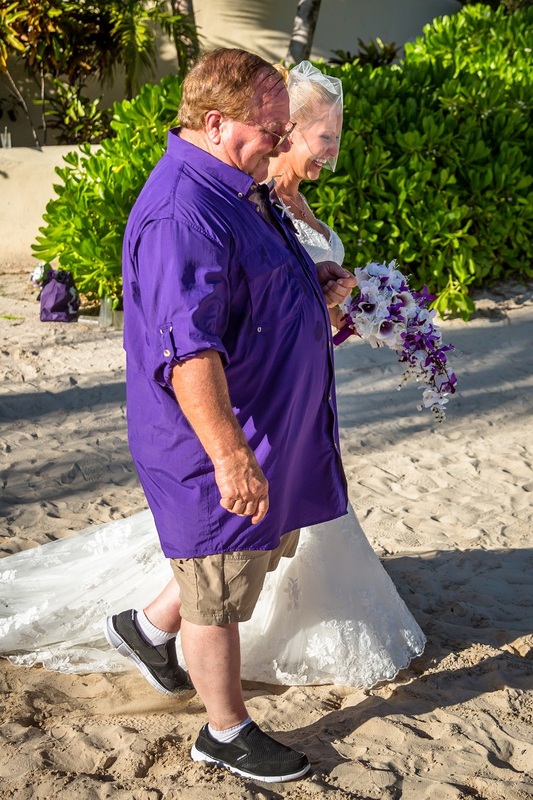 The barefoot sandals were a BIG hit, all the females loved them and wore them not only on the wedding day, but during their vacation! My real name is Katrina, but pretty much everyone knows me as Katy. During the ceremony however, the officiant was using our legal names. After calling me “Katrina” a few times, a guest shouted out “KATY!” The officiant got a surprised look on his face, turned around to the crowd, then back to us. He then said “I take it you would rather be called Katy, so from this point on I shall call you Katy”. Everyone in the crowd was laughing so hard it took a few seconds for everyone to gain composure and continue the ceremony. The most memorable moment was when…. For JR, the most memorable moment was the “I do’s”. JR was asked first to give his vows and say his pledge. 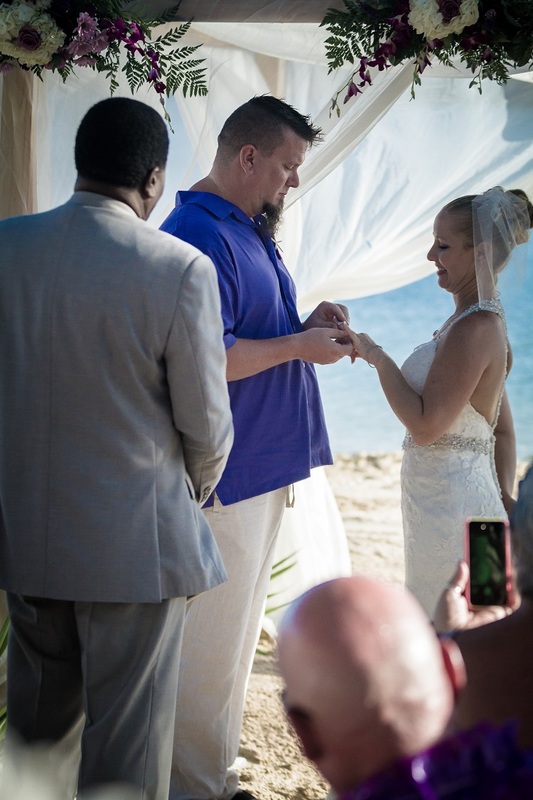 The officiant then turned to me for me to verbalize my vows. 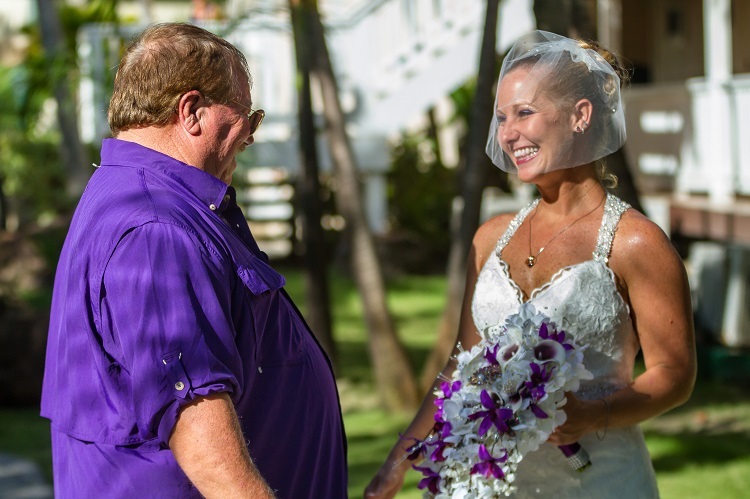 When he asked if “I would take this man, to have and to hold, in sickness and in health, till death do us part”…. I jumped up, said “I do” a little too loudly and too high pitched! Friends and family laughed and even JR laughed beside me. He said that the way I said that was the perfect little rendition of me. The favorite part of our trip was the memories made between the two of us and our family and friends. The resort offered many activities daily, such as scuba diving, snorkeling, sailing, stand-up paddle boarding, and other water activities. The sailing was low key and perfect for beginners. After the week at St. James Club and following the wedding, everyone with our wedding group had left the island and JR and I went to the opposite side of the island for our honeymoon. So we were able to view both sides of the island and the difference in their landscapes. We have already planned our anniversary. We are going to Grenada for a week! 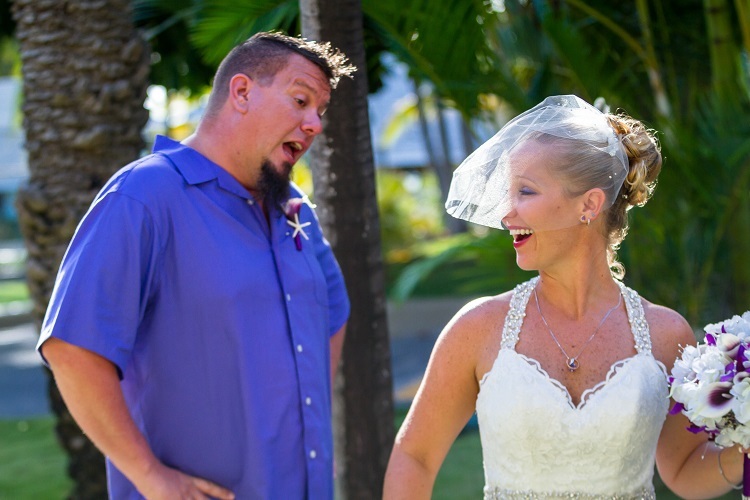 Several things I learned from a destination wedding. 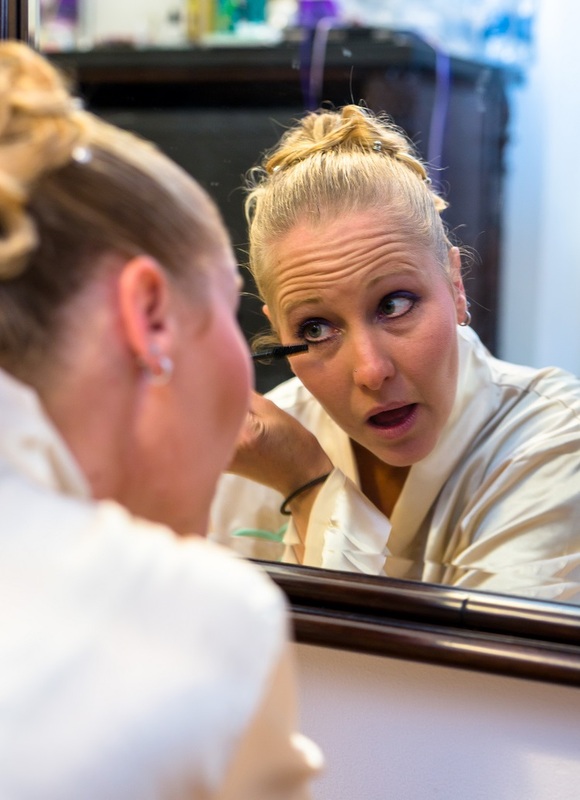 Your wedding Specialist is your best friend!!! Someone located in the US to aid in contacts between resorts, photographers, vendors is a must have. 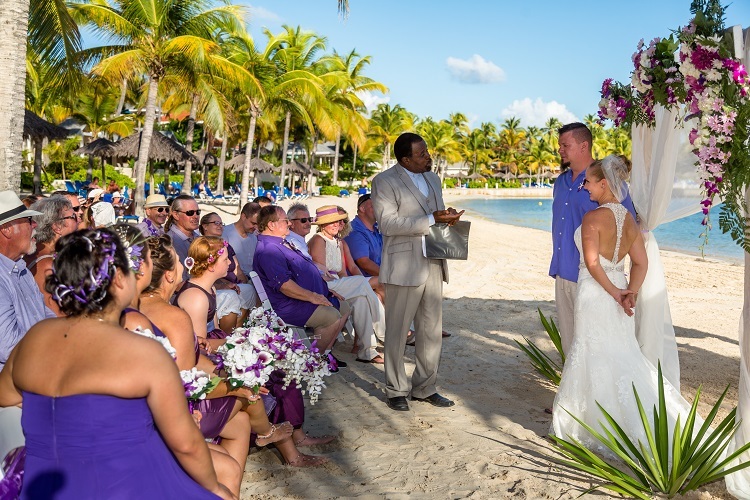 Initially our thought on a destination wedding was that no one would show up, but the funny thing is, the important people were the ones who attended. Our family and close friends all were able to make the long trip to Antigua and also got to take a vacation in the process. After the wedding, the rest of the week was free for them to experience the island. Your family and friends want to share in this important step of your life, so don’t worry about the guests that can’t make it; you will all still have a blast! For more real wedding inspiration, check out our Pinterest page!